When we think of railways, it's the stations that have the most enduring and evocative appeal. These were the structures that that came to personify the golden age of rail travel. From the 1930s onward the railways began to abandon unprofitable lines and slowly the stations began to disappear. Today only a handful stand and very few remain in use. Now known as Terminus Lucien-L'Allier. Urban stations for the most part have survived. Very little expense was spared when these stations were built. Most were designed by top name architects and built in an opulent style befitting the times, such as Victorian Romanesque, Greek revival or Art Deco. They have survived not so much because they're needed but rather because they've grown to become part of the city's architectural heritage. Those in larger cities or in popular tourist locales were generally accompanied with an adjacent or nearby hotel, often renowned for its elegant decor and superb service. In the golden age of rail travel, railways took pride in doing things in style. Rural stations were far more sedate. Generally built from frame or brick, they were frequently adorned with Victorian gingerbread, small turrets, or other decorative elements from the period. The turrets served a twofold purpose of adding design and visual appeal, and providing a point of reference to the locomotive engineer. 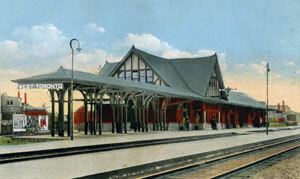 In addition to providing rail service, rural stations frequently served as the communications hub of the village. In the early days, they were often the only place where one could find telegraph or telephone service. 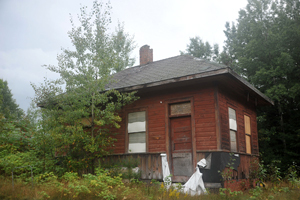 Most rural stations included living quarters for the station master and family. Station masters were highly regarded and held an elevated social position within these small rural communities. At the very bottom of the heap were flag stops where the train would only stop if it was flagged down. Flag stops were little more than unmanned huts with benches pushed against each wall and a timetable tacked up near the door. Some of the larger ones boasted small pot-bellied stoves so passengers wouldn't freeze to death during the winter. By 1978 both CN and the CPR were out of the passenger rail business. From the standpoint of both railways, there seemed to be little reason to continue paying for upkeep and maintenance of aging buildings that were no longer in use. Both railways launched an assault that amounted to a demolition derby on these small stations. Things finally came to a head in November 1982 when the CPR went one step too far. Despite major opposition from both city politicians and local residents, the CPR, tired of protracted negotiations between the city and residents, did a pre-dawn hit and run on the suburban West Toronto Junction station. Residents awoke in the morning and were shocked to find their beloved landmark reduced to rubble. The CPR's stealth-like actions, later likened to a commando raid, made national headlines from coast to coast. 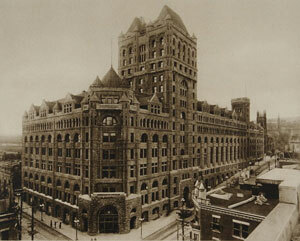 In 1985, following the CPR's unauthorized demolition of the West Toronto Junction station, the government brought in the Heritage Railway Stations Protection Act. All stations are now protected and changes, which include transfers of ownership, must be referred to the Minister of the Environment for approval. Although change of use is permitted, repairs and renovations must reflect the heritage character of the station. Over the last 25 years, both CN and the CPR have become far more proactive in community involvement with the launch of various grant and fundraising programs. These include the CP Holiday Train, which has operated since 1999, and a $1.25 million dollar donation from CN for a roundhouse and conference centre in Squamish, BC. Many large urban stations remain in use both for railway purposes and as a transportation hub where passengers can connect to other forms of transportation such as buses, commuter trains and subways. A few rural stations continue to be used for railway purposes. A number of surviving stations have been converted to a variety of other uses including commercial, residential, municipal or for cultural uses, such as libraries, museums and art galleries. Others lie in a state of abandonment waiting for the inevitable attacks from graffiti artists, vandals, and arsonists, intent on hastening their final destruction. This site celebrates the stations as they once were. All aboard for a little taste of railway station history.